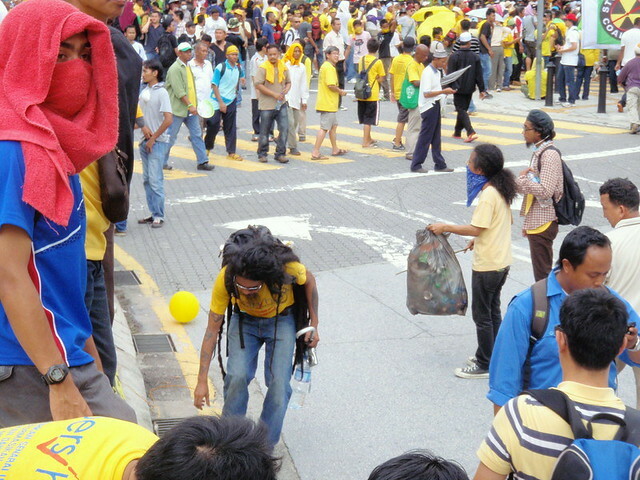 Over two weekends have passed since Bersih 3.0 rally took place in the heart of Kuala Lumpur on 28 April 2012. Popular newspapers reported a day after the event, that there had been tens of thousands of people thronging the streets surrounding Merdeka Square or the Independence Square to rally for an overhaul of the electoral system. As days passed, conflicting reports from the media, political parties, and the man on the street appeared in print, blogs and youtube. In the English, Malay, Chinese and Indian languages, some told of peaceful demonstration, some of hooliganism and some on police brutality. A controversy between a BBC edited video footage and Astro, the local satellite television provider, still looms in media reports. 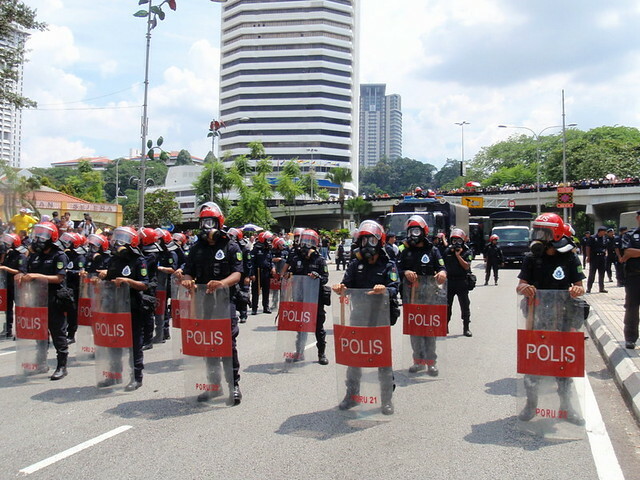 The members of the ruling coalition, Barisan Nasional, and their cohorts continue demonizing the committee members of the Bersih movement for bringing disorder to the streets, and disruption to businesses and therefore disturbance to the nation. 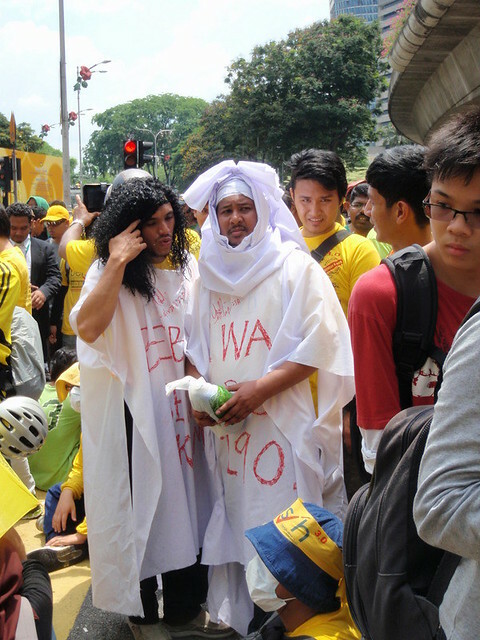 Bersih 3.0 had been a historical event as Malaysians from different social strata, religious beliefs, and ethnic background, gathered together to protest against an unfair election system which serves to protect the ruling coalition’s seats in the government. Not only were the demonstrations held in Malaysia, there were at least 11 other locations around world where Malaysians gathered together to speak their minds. The Malaysian citizens or the rakyat are tired of the ongoing corruption festering in the ruling coalition. Barisan Nasional has been in power since Malaysia broke away from British rule in 1957. While Malaysia has climbed up the economic ladder since gaining independence, increasing levels of corruption and selfish pursuits of the ruling coalition as years passed has plateaued Malaysia’s growth and kept this country, rich in talent and natural resources from truly becoming an economic powerhouse. The rakyat is tired of the large misappropriation of public funds, lack of transparency in the nation’s management, poor administration of the country, and the thug behavior of those in power. The ruling coalition had forgotten to whom they are working for. Corruption at the top only breeds more corruption down the line. 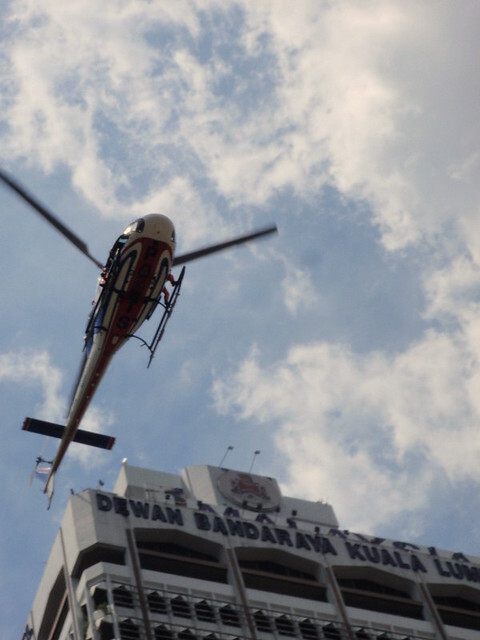 I had driven down to the city and parked a few kilometers from Merdeka Square. Arriving about 11am, there were already many Malaysians walking from different directions carrying banners and flags, and wearing yellow or green clothing. Many shops remained open for business. Some had their shutters partially rolled down for quick closure. I dropped by an eatery for a quick lunch where I met a Vietnamese tourist who had arrived the night before and wasn’t aware of the impending street demonstration. She had planned to walk down with her husband to Merdeka Square to visit a church later in the day. I suggested she visit alternative venues just for today. There were 6 meeting points designated around the city for demonstrators to meet and rally down the streets towards the square. 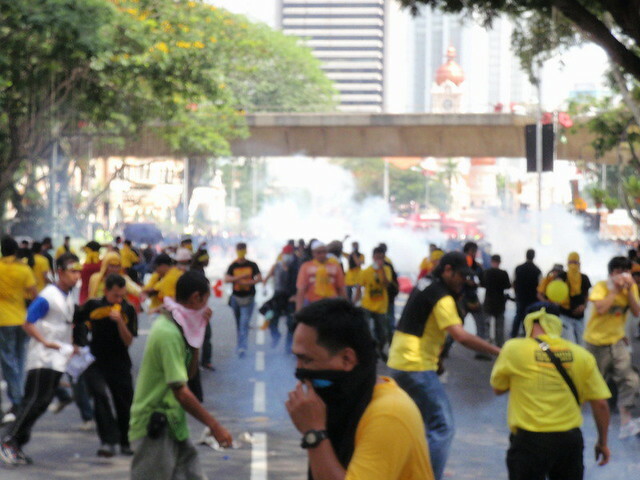 All Bersih gatherings are meant to be peaceful demonstrations however the ruling coalition would always denounced the movement and deprived them of their chosen venues even though the right for public assembly and to demonstrate is within the Malaysian constitution and are part of the fundamentals of democracy. If the ruling government is fair, just and orderly, they should not be afraid of a peaceful public demonstration by the citizens to voice their minds. Police and Federal Reserve Units (FRU) should only be around to keep order and prevent riots from taking place. Bersih 3.0 had been denied entry into Merdeka Square even with early applications made to respective public administrations. Can you imagine Malaysia citizens being denied from entering a national heritage for whom parents and ancestors were commemorated for defending, fighting and building the country. Can you imagine razor barb wires, steel barricades were put up at all entry points to keep all of us away from a patch of green lawn. 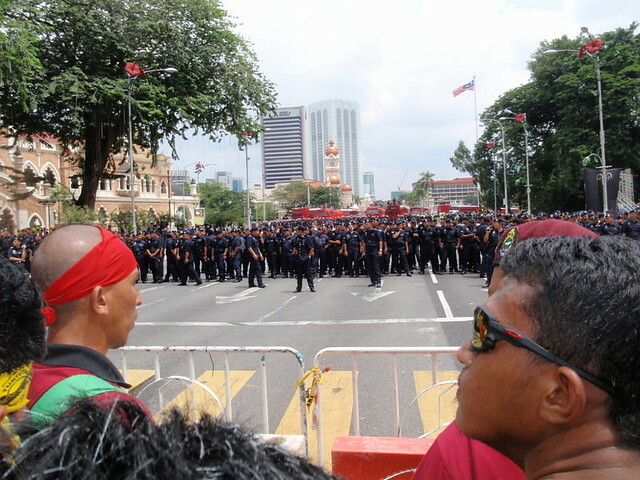 Police and FRU forces had locked down the square and stood staring out at the rakyat. All this blockade paid for with public funds. 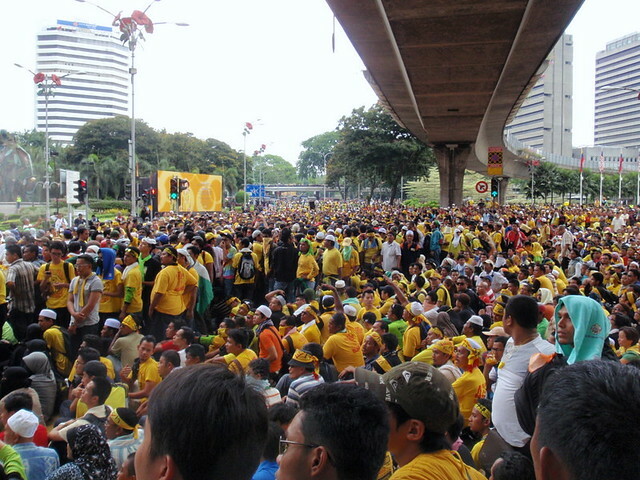 A sea of Bersih demonstrators at one entrance to the Square. A breach of the barricades at about 3.30pm initiated a response by the riot control authorities to use water cannons and tear gas to disperse crowds. Whether the breach was planned by some sects of Bersih or instigated by agent provocateurs linked to the ruling coalition cannot be ascertained. Earlier I had noticed a gentleman attempting to draw demonstrators closer to the barricades. When many around ignored him, he began targeting the youths with the same rhetoric speech to bring more people to the front. I left the area soon after. 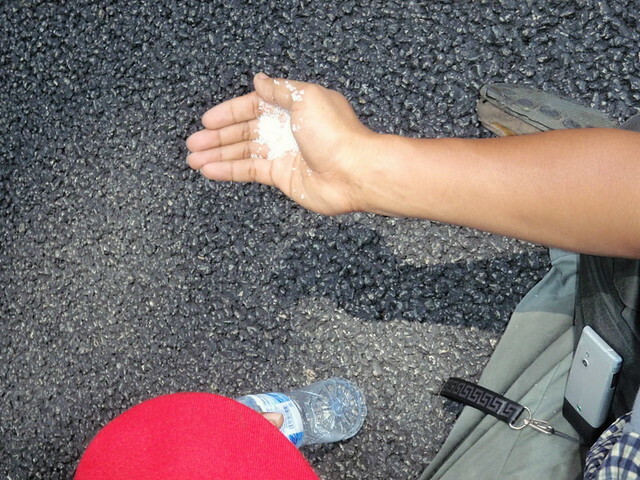 Responsible demonstrators helped each other by offering salt to ease the effects of tear gas. Bersih 3.0’s peaceful sit-down rally had been scheduled between 2-4pm. I kept to this schedule and so did many other law abiding and good willed Malaysians who came out with friends, families and strangers on the streets to display their discontentment with the government. The rakyat gathered together chanting slogans and singing patriotic songs. I came to observe and to be a part of the citizens wanting a reform in the election system and country management. Many others present probably had the same goals. Thanks for posting your perspective on it. You were very brave to go down there that day. Nice post on a subject still very fresh in the minds of many malaysians. I commend you and the rest of malaysians who were brave enough to join Bersih 3.0! God Bless u & take care. I am just thinking is there at least one country in the world without corrupted government? Protests seem to be taking over the world at the moment. 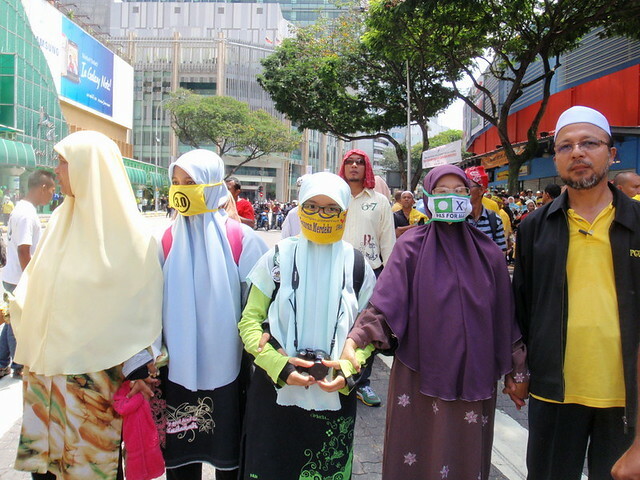 So cool seeing Malaysians come together for this peaceful protest. it’s always surprising going to a peaceful rally and seeing how protesters are treated and restricted from certain areas– as if a free speech demonstration is the greatest threat to national security. Great coverage!